This recipe for Russian root vegetable stew or ragu iz ovoshej is delicious with dark rye bread and a little butter, and can easily be a vegetarian main course. Russians like their vegetables very soft, so forget your notions of al dente vegetables for this dish! Common root vegetables include potatoes, onions, garlic, carrots, and beets. Their not-so-glamorous, but equally delicious, cousins include turnips, rutabagas, parsnips, and celeriac (celery root). In a large skillet or Dutch oven, saute onion in oil over medium heat until translucent, about 3 to 5 minutes. Add the carrots, potatoes, rutabaga, turnip, parsnip, and celeriac, and saute, stirring frequently, for about 10 minutes or until vegetables begin to collapse. 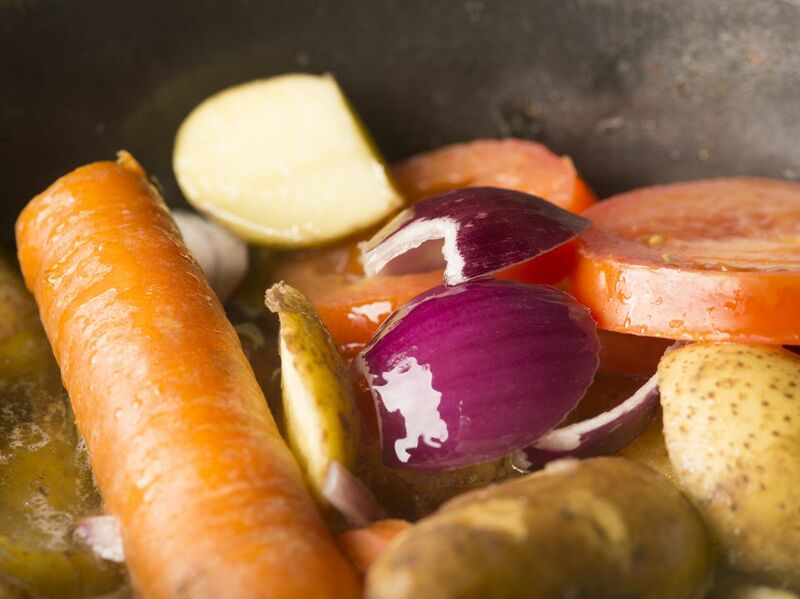 Add stock, bring to a boil, cover, reduce heat and simmer for 20 minutes until vegetables are soft but still hold their shape. Add parsley and butter and stir until butter has melted. Season to taste with salt and pepper. Serve with dark rye bread or sourdough rye bread and butter.